Get the complete package of CBSE Class 12th Physics, Chemistry and Mathematics solved guess paper. This set of guess papers is very important for coming CBSE Class 12 board exam 2017. 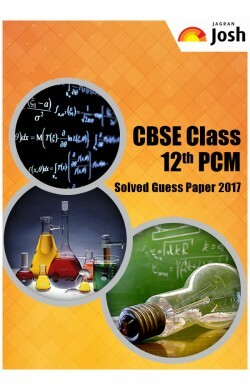 Jagranjosh.com presents CBSE Class 12 Solved Guess Paper for Physics, Chemistry & Mathematics. This set of solved guess papers is a collection of extremely important questions for CBSE class 12th board exam 2017. The blueprints of these Guess Papers are almost similar to latest Class 12thsample papers issued by CBSE for 2017 board exams. These papers are developed by subject matter experts at Jagranjosh.com after the comprehensive analysis of previous year question papers & latest CBSE sample papers. According to our subject matter experts, there are some important concepts in Maths, Physics and Chemistry subjects which are frequently asked in CBSE class 12th board examinations, every year. All the questions given in these solved guess papers are based on such important concepts. The format of these solved papers is more or less similar to latest CBSE class 12 sample papers 2017. Every question of guess papers have detailed explanations with which students can easily understand what & how much they must write in CBSE class 12th board exam to score maximum marks. There are 3 guess papers or 3 PDFs (1 PDF for each subject). Blueprint of each guess paper is almost similar to the sample paper issued by CBSE. Each guess paper offers explanations or solutions to each & every question. Each guess paper is followed by latest CBSE marking scheme. These guess papers focus upon questions which are extremely important for CBSE Class 12 Board Exams 2017. These guess papers are useful for building student's confidence level for the final exam. These guess papers are essential for practice as well as to assess preparation level for coming CBSE class 12 board exams 2017.